Tryout season is here and there are plenty of kids out there looking for a team. I believe a major factor in selecting a team is the quality of the coach. It’s probably an overstatement, but I would venture to say the main reason why a parent moves their kid from one team to another is because they believe the new team has a better coach. In today’s post, I’d like to share what I think is a misunderstood and overlooked characteristic of a great youth sports coach. To find a good coach, look for someone who is comfortable not doing anything. Not talking or yelling or waving their arms. Not making speeches or issuing praise or pacing the sidelines. Not doing anything except the most important thing: sitting back and letting the performance happen. I’d like to make three points with this statement in mind. For the first point I’m going to barrow an idea from Tim Gallwey’s book The Inner Game of Tennis. 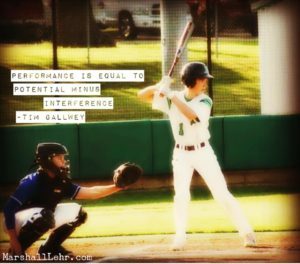 Gallwey says “performance is equal to potential minus interference.” I believe many times we can serve as a distraction and negativity effect our player’s performance. Coaches, doing what they think coaches are supposed to do, pile on pressure and instruction in the heat of the battle. “We’ve got to get this win” they say, but the extra pressure introduces fear and stress. Check out Performance = Potential – Interference for more on this. The second thing I see regarding this is the coach who insist on notifying his players that they just screwed up. In most cases, the player is aware of their error and are keenly aware of the coach’s objection to errors. There may be some instances where the player is not completely aware a mistake. If a young player didn’t realize they should have been the cut off on a play, then instruction is warranted. However, when the first baseman misses a ball that hits them in the glove, they know everything they need to know in the moment. They know the coach doesn’t like errors. They know it’s a play they must make. A coach yelling and waving their arms does not change the result of the last play. However, highlighting their mistakes during the competition can adversely affect the next play. The third point I’d like to make is one I’m passionate about, and that’s development. When a player is not allowed to make decisions during a game they are robbed of development opportunities. I see it all the time. The coach shouts instruction every time the ball is put in play. Players never get the opportunity to make a decision and think for themselves on the field. A line I’ve adopted from Mark Upton is that the decision is part of the skill. Generally speaking, I like to say if the ball is in motion be quiet. There are times when instruction during a play is applicable but for the most part I believe our kids are well served by being allowed to make game time decisions. The decision is part of the skill. See the short video below for more on this. If you’re looking for a new team, check out Mia Hamm Principle for some things to consider.